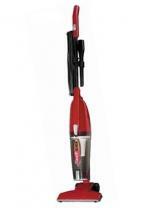 The Swift Stick bagless vacuum has a 1.2 amp motor w/a lightweight design, metal handle and straight suction nozzle, A crevice tool aids in cleaning hard-to-reach areas, A 16 ft power cord is included. The Scorpion Quick-Flip bagless hand vac has a 7 amp motor with 840 watts of power, It features the Quick-Flip crevice tool to clean small spaces, 16 ft power cord, flexible hose, upholstery brush and carry strap. The Extreme Power Cordless Stick Vac has 14.4 Volts of extreme power and a rotating brush for carpet cleaning w/brush roll shut-off for scratchless, barefloor cleaning, Features a fold-down handle for convenient storage and removable dust cup.